There is never a dull moment in Baltimore, Maryland. It seems as soon as HBOâ€™s â€œThe Wireâ€� program left town, our Mayor, Sheila Dixon, became the subject of a state corruption probe. Itâ€™s all mostly about two fur coats and some travel trips with an ex-boyfriend. At the time, he was a developer doing business with the city. Does it add up to bribery or is it a tempest in a teapot? The Grand Jury holds the answer to that question. Stay tuned. 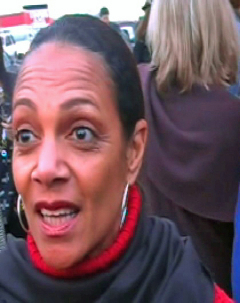 A former school teacher, Mayor Dixon, age 55, is the first African-American woman to be elected to that office. She has a masterâ€™s degree from Johns Hopkins U. and has done a reasonably good job, since coming into office in January, 2007. But, like so many politicos, she is known to have a cozy relationship with some of her fat cat supporters. How cozy is the critical question? Mayor Dixon has also let the activist community down on one important issue. They have been fighting the draconian BG&E rate hike, but she has declined to fund a feasibility study that was authorized, in 2006, by the City Council. It deals with a possible municipal takeover of the utility. Mayor Dixon does, however, have some good points. She is appreciated for being even-tempered, unlike some others who have held that office in the past. This is how â€œThe Wireâ€™sâ€� writers saw Sheila Dixon through the character of Ms. Nerese Campbell: â€œWith her eye on Mayor Tommy Carcettiâ€™s office, [she] offers the clout with the [church] ministers and influence on the [City] Council as a down payment towards her ambition. Carcetti assures her that his imminent run at the state house [for the office of governor of Maryland] will free up the big chair, but Nerese, far too crafty, to take anyoneâ€™s word on a promise like that, continues to position herself as an indispensable liaison.â€� (5) How prophetic! Legal background: The City Council President is a member of the Board of Estimates, which under the City Charter, controls all municipal spending. Itâ€™s a five member board, which meets every Wednesday in a public session. Everybody and his brother knows that it is the Mayor (during that time period, it was Oâ€™Malley), who dominates the Board. He has one vote and two other voters, the City Solicitor and the Director of Public Works, are his appointees. In other words, the Mayor has three votes--a working majority on the Board. The other voting member is the City Comptroller--an elected office holder. So, in the critical time period in question, even if Dixon did vote in favor of certain contracts that benefitted an associate, there was no way she could have guaranteed or controlled the final outcome. That fact, I submit, is going to be a significant legal hurdle for the Special Prosecutor to overcome. However, Mayor Dixon could be vulnerable on other grounds, such as not filing the proper disclosure papers concerning receipts of gifts and/or for not recusing herself from voting at the Board of Estimatesâ€™ sessions. But, these kinds of violations, if they did happen, are generally treated with a reprimand by the ethics board which oversees such conduct and filings. That is assuming that getting a gift from a boyfriend requires disclosure, a filing and recusal. Who knows? A tax angle to the case and the Mayorâ€™s family relationships and alleged ties to city contracts, are also being scrutinized. This can get all legally murky real fast. Keep in mind that the Special Prosecutor, Robert A. Rohbaugh, is a seasoned veteran of the court room. As an ex-Assistant U.S. Attorney in Baltimore, he is known an expert on criminal cases of this sort. It was the U.S. Attorney in Baltimore who brought ex-V.P., Spiro T. Agnew, to the Bar of Justice. Time to lament. First, the city lost â€œThe Wire,â€� and then this corruption probe of Mayor Dixon hits home. While she is under a legal cloud, the city employees, especially those that she must count on, will be wondering about their future. To say that this criminal probe is a major distraction for her and bad for the citizens of Baltimore who count on her leadership, as the national economy slips into a recession, is an understatement. Baltimore has many serious problems, some of which, like its drug related murder rate, surfaced in dramatic fashion on â€œThe Wire.â€� Nobody knows better than David Simon, the showâ€™s creative genius, what deep trouble our America, including our major urban centers, are in. (6) Corporate dominance, via campaign donations, over our elected officials, at every level of government has to end. We have got to get money out of our electoral politics or we can kiss our democracy good-bye. How will this all end? Will the Grand Jury refuse to indict Mayor Dixon? Thatâ€™s possible in a case like this where the putative facts against her are not so legally clear cut. Unless, of course, the prosecutor has a lot more than he isnâ€™t presently showing. Could be? Or, if the Grand Jury does indict, will a jury of her peers acquit her? Or, will she be indicted and then forced to resign by the City Council? If she is forced out, the Council President, Ms. Stephanie Rawlings-Blake, will become mayor. Stay tuned as Baltimore City takes center stage again. This time, itâ€™s not on your television screen, via HBO, and â€œThe Wire,â€� but in a forum which art imitates. Or, is it vice versa? Looking back, the last City Hall politico to go down in flames was the late Wally Orlinsky. He was the City Comptroller back in the early 80s. He ended up in a federal slammer after a conviction on a bribery charge. I say: Let justice run its course in the matter of Mayor Sheila Dixon. And, let her be treated fairly by the system. Most Baltimoreans will demand no less. and â€œA Tale of Two Cities,â€� by Louis Miserendino, Baltimore Examiner, June 26, 2008. Â©2008, William Hughes, All Rights Reserved.